How many times have you gone to bed after a long, unproductive day with the intention that tomorrow is going to be different? Then you get up the next day and fall right back in the same trap. It feels like your trapped inside your own personal version of Groundhog Day. And before you know it, it’s lunchtime and you can’t point to one significant thing that you’ve accomplished. In my own experience, the best way to ensure that I have a productive day is to set myself up to have one the night before. This allows me to make sure that I do the most important things first. Even if something unexpected comes up, I’ve completed my most important tasks. I structure everything around this. 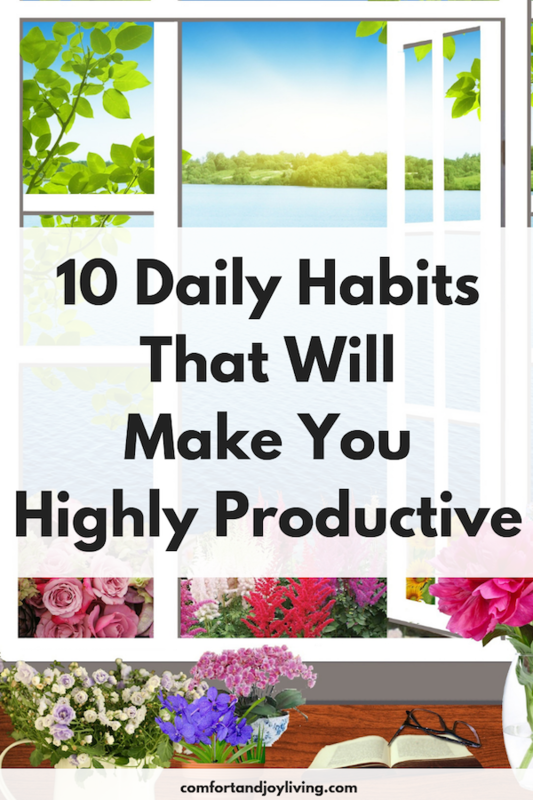 Here are 10 daily habits that I use to set myself up for the most productive day possible. Mornings can be so stressful. By making a list of everything you want to accomplish the night before, you’ll be able to relieve some of that stress. Not only will you feel more ready to start working right away because you already know what you need to do, you also create a definitive end to your current day and you can relax, knowing that tomorrow’s list will be there to tackle…tomorrow. I believe that the most important thing that helps set the day up for success is getting enough sleep the night before. Unfortunately, it’s often one of the first things to go when life gets busy! But a good night’s sleep can make all the difference between “walking through a fog” type of day and one where you have energy, focus and clarity. If you’re struggling with not enough hours in the day, by getting up at least 30 minutes earlier than normal, you can help keep that stress at bay. Even if you just give yourself some “me time”, you’ll be able to start your day so much more ahead of the game as opposed to struggling to keep up. I know for many of us, if you’re not morning person, waking up earlier is quite a challenge, but if you keep at it, your bedtime will naturally become earlier and you will adjust to your new routine. The difference between a day that starts with a morning routine and none that doesn’t will prove how effective a morning routine really is. Without a routine, my day begins with a lot of chaos, and time is wasted recuperating from misspent energy. With one though, I create a foundational support system that helps everything else fall into place and allows me to have a productive day. When creating a morning routine, it’s helpful to ask yourself “why do I want a routine?” The answers will help you through and motivate you to start each day on the right foot. Not to lay the “you are what you eat card”, but it is pertinent—the food you eat has an affect on your mental alertness, focus and also your mood. Be sure to eat carb-rich foods like grains, legumes and fruit. Carbs are metabolized into glucose which your brain uses to keep you sharp. For energy, eat protein-rich foods like tuna, chicken, eggs, lean meats, nuts, tofu and yogurt. Fruit and vegetables will provide you with necessary vitamins and antioxidants. And don’t forget to hydrate regularly. Make sure to take breaks during the day, even for just a few minutes. It will help prevent you from getting too caught up in the weeds of one thing and will provide a quick focus shift—a healthy mental and physical breather. Stand up and stretch—or take a walk around the block, go get some water or a bite to eat. You may find that you’re far more productive than when you sit for extended periods of time only to let your mind wander and dilly-dally on things like social media. I’m not saying that you can’t be productive in your workout clothes, but if you’re lie me, you’ll be even more productive if you get dressed, do your hair and put on some makeup. Why? When you look your best, it helps you be more confident with yourself and your abilities, which will motivate you to tackle your to-do list rather than being tempted to scrolling through social media or watching an episode of your favorite show. When writing your to-do list, list them in order of priority to ensure that you get the most important tasks done. To make it easier on yourself and less overwhelming, try to limit the number of priorities on your daily list based on how much you know you can complete. Remember, there is always another day. For example, no how many tasks that I have on my to do list, I prioritize 1-2. In fact, I’m able to trick myself into accomplishing more tasks by only giving myself those to complete because 1-2 tasks feel much more doable, and I’ll feel ready to take on more when I have a few wins under my belt. Time-blocking is when you batch certain tasks at certain times of the day in order to be more efficient and get more done. Basically, you segment your to-do lists. And it works. When you know exactly what you need to do and when you’re going to do it, you stop “spinning your wheels” and make actual process toward those tasks, rather than getting distracted by everything else. You may not believe this, but multi-tasking is a myth. the truth is that our brain can literally focus on one thing at a time. That means by opening up a browser tab while waiting for the current one to load doesn’t actually help you be more productive. Clear ut the mental clutter so you’re able to give yourself 100% of your attention to that one thing and finish what you start. Ever since I started a 10-minute pick-up routine in evenings, my house has continued to stay cleaner and less cluttered than before. Its not always completely clutter-free, but spending just 10 minutes a day washing any remaining dishes putting things back in place, and tidying up the living room helps to keep you in total control. You may be asking, “How does this relate to productivity? Clutter in your physical space can translate to clutter in your mind. A clear countertop equals a clear head. And, you’ll be able to get more done because you’ll have more space. Which of these habits will you start incorporating today? Let me know in the comments!